JNN 21 Nov 2014 London : The first Bus in Britain powered entirely by human and food waste has made its first journey today. Bio-Bus, a 40-seater shuttle service between Bath and Bristol Airport, can travel up to 186 miles on just one tank of gas. Gas is generated through the treatment of sewage and food waste deemed unfit for human consumption. The annual waste generated from one bus load of passengers would provide enough power for a return trip from Land’s End to John O’Groats. The bus, which has spawned a number of appropriate nick-names, including the ‘number two bus’ , is being hailed as a sustainable way of fuelling public transport while improving urban air quality. The gas used to run the bus is generated at the Bristol sewage treatment works, which is run by GENeco, a subsidiary of Wessex Water. 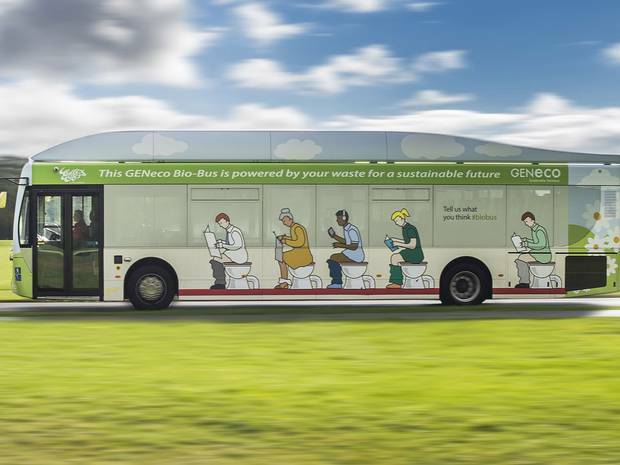 The eco-friendly “bio-bus” runs on biomethene gas, which is produced when human waste products are treated through a process called anaerobic digestion. The vehicle has the capacity to travel up to 300 kilometers on a single tank of gas; or the equivalent of five people’s annual waste products. The bus engine is a similar size and design to those in conventional regional buses, but operates with a 30 percent reduction in carbon dioxide emission. But travelers need not worry about a potentially ripe odor affecting their journey, as impurities are removed from the gas to leave the fuel stink-free. Mohammed Saddiq, general manager of GENeco, believes treating the food and sewage waste can produce enough biomethane to provide a significant supply of gas to the national gas network capable of powering almost 8,500 homes – as well as fuelling the Bio-Bus. The first load of passengers on the Bio Bus will be visitors to the UK commuting from Bristol Airport to the historic city of Bath. Collin Field, engineering director at Bath Bus Company, said he Bio-Bus was being launched at a very “appropriate” time, as the city of Bristol would become the European Green Capital in 2015. “Up to 10,000 passengers are expected to travel on the A4 service in a month, which is available not only for airport travel, but also local journeys along the route through Saltford, Keynsham, Brislington, Knowle and Hengrove. 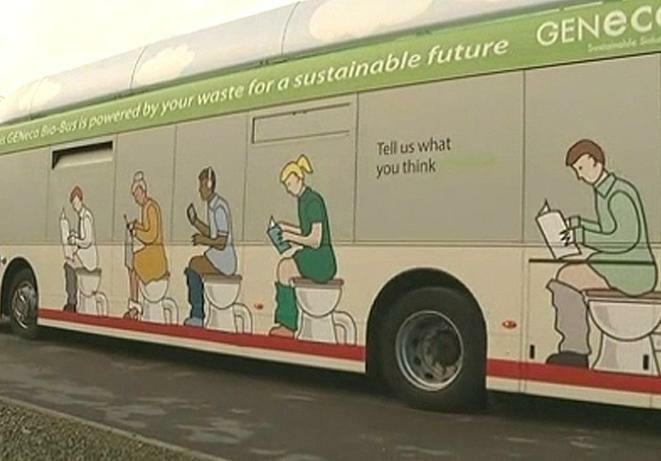 This entry was posted in Europe and tagged Bio Gas, Bio-Bus, Bristol Airport, Bristol sewage treatment, food waste, Human Waste, human waste products, Poo Bus. Bookmark the permalink.